Uncaught TypeError: Failed to execute 'texImage2D' on 'WebGLRenderingContext': No function was found that matched the signature provided. i was able to add the image earlier but now whenever i try to add any image i get this error. Have you encountered this type of error? Without much more information, I guess it could be a problem of finding the actual image. Is the path provided the right one in the yaml? 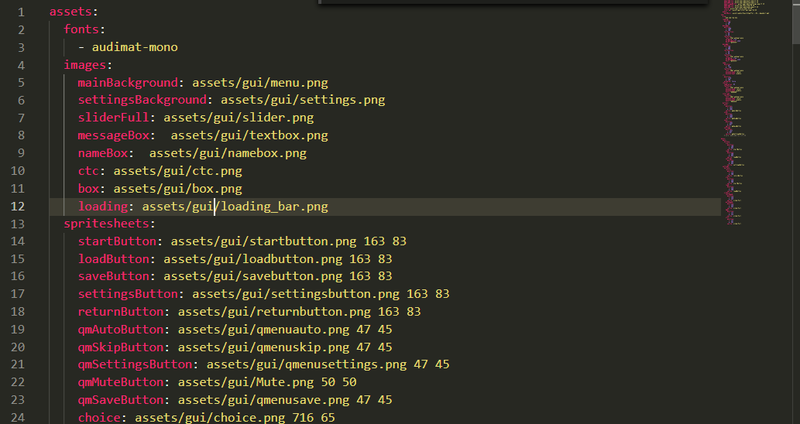 If you remove the specific image in the yaml does it work again? Also, make sure you have the latest version of RenJS from the quickstart repository. Ya i have given the right path for the image and all but the issue seems to be there. Oh, the issue is that the key "loading" is already used for the game loading bar of the game. As the loading bar and splash screen are loaded before everything in the game, including the yaml files, they can't be specified there. The game loading bar and splash screen paths are in the config file of the game, and the actual loading of them are in the bootstrap file for RenJS. If your loading bar has nothing to do with that, and it's just another kind of loading bar for the gui, you will just have to change the key name, for example use loading2, and you will then have that key available to use anywhere from the gui.